Citymapper is making a significant change to its routing app with the news that it has added what it is calling a “SuperRouter” capability. This effectively combines public transit with cabs to create completely new integrated routes. In simple terms, it means you could ask Citymapper’s app to come up with a route, and it would give you options both a cab service like Uber and a train or tram in a fully integrated route, with all the timetables. That could be transformational for people in cities, and something no other platform has tried to date, as far as we know. The change will apply to every city Citymapper is launched in right now, which includes New York, San Francisco, LA, London, Paris, Berlin, Rome, Madrid, Tokyo and many other global cities. 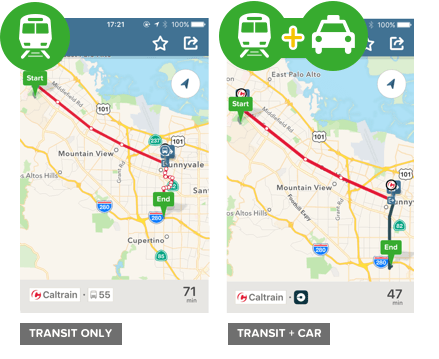 Citymapper gives an example of a trip in the San Francisco Bay Area from Stanford campus to Apple’s HQ that combines Uber and Caltrain to arrive faster. Using this combined ‘multimodal route’ of train and cab, it only costs $10 rather than $40 if one takes a cab all the way. In the app a new Preferences page has a number of personalization options. By default, “Cars + Transit” will be in “Lite” mode, and show up in a ‘Citymapper Labs’ section. But you can upgrade to “Pro mode” to see these multimodal results mixed more obviously in top suggested results when you search for a route. The advantages of combining trains with cabs is of course a better connected city, cheaper travel, potentially faster travel. It’s quite an engineering feat to combine a metro train network and the road network, while at the same time factoring in real-time information such as train departures and car availability. Admittedly it’s early days and Citymapper may not get it right 100% of the time, but it’s an exciting development. More is explained in their post here.